This is a 6 week class. We work on trick skills for 5 weeks and test for titles on the 6th week. The cost of the class includes the fee for the AKC tricks test. The value of training a dog tricks is many times overlooked because most people simply want a dog that can perform basic obedience and really don’t understand the benefits of trick training. The more you teach your dog the quicker he will learn because your dog’s learning ability will improve, as well as your teaching and communication skills. Your dog’s overall obedience, manners, and confidence level will improve. It’s a win win for you and your dog. Though tricks are great to show your dog off to neighbors and friends they are really meant for you and your dog to have fun spending time together. It is a great relationship bonding and trust building exercise for you and your dog. There are many benefits to training tricks. As well as providing great mental stimulation, trick training can be great physical exercise too. Tricks such as sit pretty or begging are great for strengthening muscles which can help prevent injuries. Tricks such as backing up or putting their paws up on props builds a dog’s awareness of their body and its movements. Many tricks will help build endurance, stamina, and muscle tone all contributing to your dog’s physical well-being. 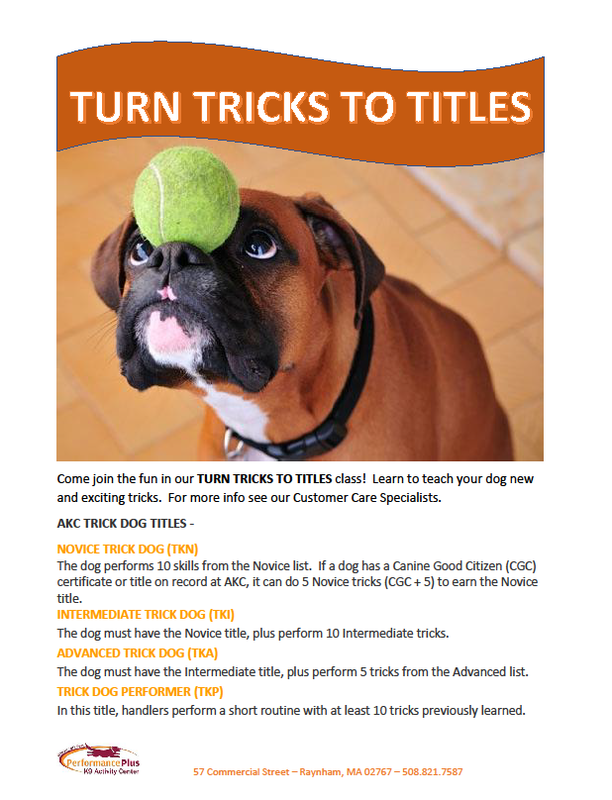 Click here to read about the AKC Trick titling program.